For the Neighbourhood Plan to be accepted by both Aylesbury Vale District Council and the Government, it is crucial that the whole community is involved in its preparation, not just the Parish Council. A public consultation was held in Stewkley Village Hall in December 2015 and there was overwhelming support for the development of a Neighbourhood Plan for Stewkley Parish. The Parish Council then established a steering group to oversee the development of the plan, led by Neil Dickens. Designating the Parish Neighbourhood (Plan) Area and agreeing the location and size with AVDC. Creating a Stewkley Community Neighbourhood Plan Steering Group, led by the Parish Council, with appropriate clubs, societies and age representatives. This will include research into the need (from the local demographics and housing requirements) Consultations (with the clubs, societies, the community in general, local businesses, school, church and statutory bodies eg. Planning, highways, environment, ecology, heritage and utilities) to form the evidence for the Plan, public meetings and presentations (to receive the village community’s views on this evidence and conclusions) and the writing up the Plan to form a document. It will cover areas such as housing need, areas for protection (eg. Listed buildings, open spaces), traffic calming and car parking, business needs, and ecology). An independent person(s) reviews the Plan and publishes his/ her conclusion Assuming there are no issues, AVDC send the Plan for a Stewkley Community Referendum. Stewkley residents will receive a copy of the final Neighbourhood Plan to review for themselves. Stewkley residents vote for or against on a given day. If over 50% voters, vote for the Plan then this is deemed approved by the Community. This page gives details of the meetings and public communications that have been held with Stewkley parishioners throughout the development of the Neighbourhood Plan. Initial public consultation on the proposal by the Parish Council to develop a Neighbourhood Plan (NP). More than 250 parishioners filled the village hall and voted overwhelmingly, by a show of hands, to support a NP. This represented approximately 20% of the adult population. As a result of this endorsement for the NP, a questionnaire was delivered to more than 670 households in the parish. Eighty percent (80%) were completed, and returned. Open meeting organised by the Neighbourhood Plan Steering Group (NPSG) to present the data and analysis derived from the questionnaire, and to consult with the parishioners on the scope and focus of the nine Working Groups (WG). NPSG members and parish councillors were in attendance from 12 noon until approx. 8pm. Comments on the proposed issues and WG activities were collated and published. On July 9th and 23rd, time was set aside for small group meetings or one-on-one meetings with the chairman of the NPSG to talk about any issues related to the NP. A call for sites was issued via the Grapevine and village notice boards. All landowners interested in putting forward land for development were encouraged to contact the NPSG. Open meeting organised by the Neighbourhood Plan Steering Group to publish the initial long list of sites that are under consideration. The meeting held in the school hall between 7pm and 9pm attracted about 110 villagers. Site photographs and locations were on display, and a talk was given (without slides) about the process to date. This was followed by a Q&A with the meeting participants. 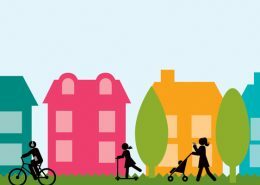 An open meeting was organised by the Neighbourhood Plan Steering Group to publish the initial conclusions of the Working Groups(WG), including the drafted Policy statements for each WG. Outline detail of 28 possible development sites were also presented for initial feedback and comment, as well as a drafted secondary ‘development’ boundary for the parish. The meeting attracted approximately 135 villagers, and on the day, 176 comment forms were filled in, of which 148 commented on the possible sites. Following this meeting, the documents were available on the Parish Council website (www.stewkley.org.uk) and the comments period remained open until 15 April 2017. At the end of the consultation period, over 700 comment forms had been received. 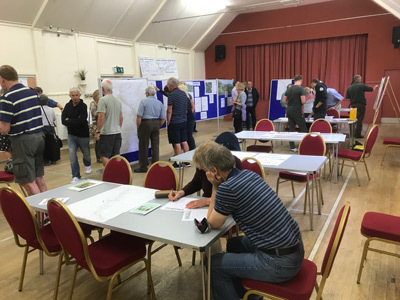 More than 250 villagers visited this open meeting arranged by the Neighbourhood Plan Steering Group to look at the shortlist of sites proposed for development, and for some, to look at detailed impressions of the potential new homes proposed on the site. The defined secondary boundary was published for comment. Eighty five comments were submitted for consideration. Without a Neighbourhood Plan the Parish could be open to speculative planning applications in areas that residents would not support. Neighbourhood Plans have helped our neighbouring villages and towns defend themselves against unwanted developments or inappropriate housing mix (size/style of housing) in the past 12 months. A ‘Made’ Neighbourhood Plan does give Stewkley Parish residents some protection and control over future development within the parish. It must be stated though that a Neighbourhood Plan can never be a guarantee against development, and a site written into a NP is not approved for development, and must go through the usual planning approval process. What is a ‘Made Neighbourhood Plan’? The term ‘Made’ refers to a Plan that has been adopted by AVDC and is therefore official. In order to be ‘Made’, the drafted Plan is examined by independent experts for AVDC for its compliance to local Plans and national planning policies and if acceptable, is put to a referendum within the parish. A simple majority vote in favour of the Plan is required for AVDC to adopt it. Audit trails, consultation and communication, and clarity of the conclusion are key to getting a ‘Made’ Plan though the final vote. Who is the plan for and who is creating it? It is for you. The Plan will be written for everyone living and working in the Parish. It is created by villagers for villagers following consultation with villagers. The more the village engage with the process, the more likely we will collectively develop a Plan that works for Stewkley as a whole. The Plan is being researched and developed by volunteers from the village who have been formed into Working Groups. It will be drafted by a consultant with expertise in writing compliant Neighbourhood Plans using the detailed findings from the Working Groups, and the information obtained from the various public consultations. 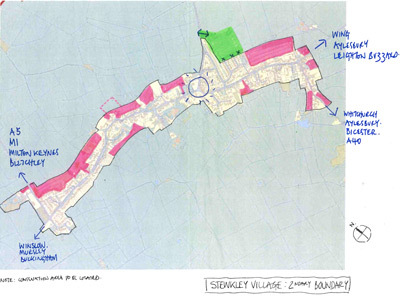 An initial consultation was held with the residents of the village in December 2015 when an overwhelming decision, by show of hands, was taken to write a Neighbourhood Plan for Stewkley. The Plan was officially started in January 2016 and should be completed by the end of 2017. A progress map is provided on the Stewkley Parish Council website. Once public consultation on the potential development sites is complete, the Plan will be drafted to incorporate the wishes of the villagers based upon the feedback and communication received. Has Stewkley Parish Council defined a Code of Conduct for the Neighbourhood Plan team and its Steering Committee? Yes. Terms of Reference have been issued by the Parish Council to the NP Steering Committee. They are available for review on the Stewkley Parish Council website. Steering Committee members declare their personal interest in the Neighbourhood Plan. These are being updated for the 2017 Steering Committee and will be posted on the website within a few weeks. Why have some landowners been displaying information about their potential developments at NP exhibitions? The NP team cannot stop any resident or landowner from providing information about a particular site or sites, in addition to the information that is presented by the NP team as part of the consultation process. What is required however is that any resident or landowner who wishes to exercise their democratic right to voice an opinion does so in a location clearly separated from the NP team exhibition areas and makes no attempt to imply that they are part of, or are assisted by, the NP team. How has the consultation process been defined and advertised? Following the initial public consultation in December 2015 where the attendees voted to support the creation of a Neighbourhood Plan, consultations have been held at key points where new information has been available to share with the public. As examples: The results of the village survey were shared in a public consultation; Possible site locations following assessment by the NP team; Detailed information on sites incorporating feedback received from AVDC Neighbourhood Plan support staff and independent experts in planning; Drafted NP policy statements. Exhibitions are usually held either in the village hall or school for a whole day over the weekend. They are set up and manned by members of the NP team and Stewkley Parish Council. The exhibitions / meetings are advertised ahead of time in the Grapevine. Parish noticeboards are used to display posters, on several occasions leaflets have been distributed to every home in the parish, recently the Neighbourhood Plan FaceBook page has been used to promote meetings. Why are we sometimes asked for opinions or to vote on different but related topics separately (for example the drafted secondary boundary and site locations). Wouldn’t it be more logical to combine them? We understand that sometimes the process appears ‘out of kilter’ but that is because there are several pillars to this Plan and they are moving forward at different rates. 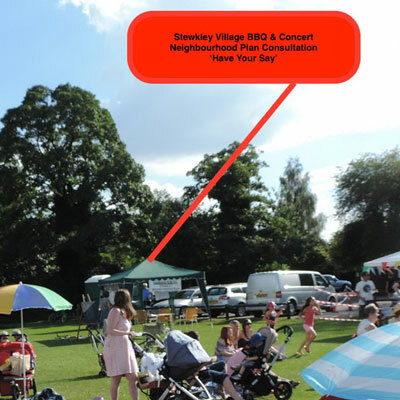 Getting this Plan ‘Made’ as quickly as possible is critical for the future of Stewkley, so it is important that we get the views from the villagers to help us progress in as timely a manner as possible. All aspects of the Plan will be brought together as a drafted Plan in mid 2017, and everyone will have an opportunity to review and comment on the whole document. How were the potential areas for new homes decided upon? Potential sites for development were identified using both an active and reactive ‘Call for Sites’. Land owners in Stewkley Parish were invited to submit sites for development. Members of the NP team contacted other landowners who had not come forward during the active Call for Sites to confirm if they wished to develop their land. The NP team started with a master list of 53 sites comprising land that had been identified from both steps 1 and 2. As a result of the Step 2 consultation, sites were excluded because the owner did not want to develop it. The remaining sites were entered into the process for assessment. Only sites that were entered into the process have been identified by location and landowner. How will the housing mix be decided? Respondents to the village questionnaire identified starter homes and retirement homes as those most needed in the future. As there was over 80% response from the parish, this is a good indication of what villagers think is required. Achieving the desired housing mix on smaller developments is challenging and a policy statement will be included in the Neighbourhood Plan to ensure that homes are built that meet local needs. The site summary for each proposed location will include the type of housing that would be supported by the residents. Won’t infill between individual sites result in an overcrowded look to the village roads? The NP will identify location of development sites that have been agreed by the residents. It is expected the Plan will identify, either through a Policy statement or the individual site summaries, the limit on the number of homes per site and a reluctance to approve ‘bunched’ sites. What if I object to a particular site for personal reasons or I am against all development in Stewkley? The starting point for the Neighbourhood Plan is an acknowledgement that new homes will be built in Stewkley over the next 20+ years. Neighbourhood planning gives communities direct power to develop a shared vision for their neighbourhood and deliver the sustainable development they need. It is way of helping local communities to influence the planning of the area in which they live and work. Not all development will be wanted by everyone, and there will be opportunities for individuals to object when the plans are submitted for planning approval in the usual way. Land owners want to get the maximum value from their land, where does the subsidy for affordable homes come from? Affordable Homes are a requirement for developments over a particular size (currently more than 14). The Soulbury Road development will be required to deliver a number of affordable homes as part of the agreed housing mix. Therefore the subsidy comes from the landowner. The NP will examine ways to provide low cost homes to rent or buy. This is different to affordable homes. Will a new build residential development nearby reduce property values in Stewkley? New houses or developments have no noticeable effect on house prices, either negative or positive. A recent study has shown that new housebuilding has little discernible and consistent impact on local house price patterns. The report by LSE London, entitled ‘Understanding the Local Impact of New Residential Development,’ was jointly commissioned by Barratt Developments, the largest housebuilder in the UK, and the NHBC Foundation, and addressed the question of whether a new development will always reduce prices or reduce the rate of increase in prices in the immediately surrounding area. Examining the impacts of eight recent residential Barratt developments on their local areas, the research concluded that prices did not decline as a result of development, although sometimes there may be some limited impact during construction. Once the developments were completed, the local areas generally moved with the market. Is there a risk that the requirement for adapted homes will increase the building costs and make developments unviable? No. The land being offered for development is largely agricultural land, which has a lower per acreage cost than developed land (‘brown’ sites). The value of this land will increase dramatically with planning permission so profit for the developers and landowners is guaranteed. AVDC, in their draft Local Plan, highlight all houses must be capable of adaption for disability, and 15% should be fitted out for disability when built. Won’t landowners and developers want to build profitable homes on their land? Why would they want to build adapted single-storey homes? There is a presumption that a single-storey home has a larger footprint and will sell for less money than a two-storey home thus reducing the number of units that can be placed on any site, and reducing the total retail value for the whole development. Footprints for single-storey houses plus garden do not need to be larger than for two-storey houses plus gardens. In 2015, the Papworth Trust (a charity that helps disabled people live independently) launched two single-storey accessible homes built on the same footprint as a two-storey home, as a stimulus to developers to be more creative when considering accessible homes. In 2015, the same group highlighted the lack of new build bungalows and single-storey homes (1% in 2014 down from 7% in 1996) and urged the government to ensure this trend is reversed. Recent house value estimates from Wilkinsons linked to the development planned for 66 High Street North show that there are marginal price differences between single and two-storey houses. This has also been confirmed by scanning websites for new developments in surrounding counties including Cambridgeshire and Bedfordshire. In some instances, well designed and appointed new build 2 bedroom retirement bungalows are listed at higher prices than new build 2 bedroom semi-detached houses. It is expected that selling prices for single-storey homes will increase because the demand will outstrip the supply. Given that the sites proposed in Stewkley are designated (Planning terms) as agricultural, a change of use for these sites can immediately increase the profit for each site by 20 fold or more. These sites can therefore allow a very substantial profit even if all houses are single-storey. Will all the adapted single- storey homes be sold at market prices or be available as affordable housing? Each site included in the Neighbourhood Plan will have a site specific housing policy that will identify the housing mix and affordable homes requirement. The affordable home requirement will include some single- and two-storey homes, with up to three bedrooms, to give flexible options for all those who would benefit from the provision of affordable housing in the parish. This includes people of all ages and abilities. Some single-storey homes will sell at market value, which may be at a market-inflated price because of the decreasing availability of these homes in the available housing stock. SPC are looking for sites to have homes that meet the budgets of those on low income but do not meet the requirements by ADVC for Affordable Homes. These might be private share ownership or rented accommodation. These could be 1 or 2 bed houses, or flats (maisonettes). Why is there not more detail about the number and size of properties being considered for each site? These details will evolve with the Plan. The NP team continue to analyse feedback from the village about housing needs, location constraints etc., and this will inform recommendations for number and type of housing on each site. It would be difficult to provide this while the analysis is still on-going. Site summaries have been provided which give more information about the site location and access. In due course, information about number of houses and type of housing will be published. Why are some sites coloured (red, green and orange) and others are not? The colours that appear on the site information sheets currently available for view on the Stewkley Parish Council website have no relevance. If there were meaning, a key would have been provided. Nothing should be interpreted by a colour used to outline the position of a particular site on any particular map. Why and how did the NP team ‘score’ the sites? Scoring the sites was a first step in deciding which locations would be likely to fit with the emerging policies in the NP. The criteria by which sites were scored were deduced from the village questionnaire and took into consideration ease of access (traffic and parking), impact on countryside views, protection of linear and rural nature of the village, protection of green spaces and environment, the village requirements for housing type and avoidance of large developments. Some sites may look large but the land owner only wants to develop part of the site, or place a few homes on it, so at this stage the size of the site is not an indicator about the potential number of homes. Sites were then assigned a score for the various criteria depending upon whether they would meet a village need, and whether the impact of development could be mitigated. These initial scores were used initially to help focus priorities of discussion however they have been supplemented now by additional comments received from external consultants and the village vote. Isn’t access from the main roads an issue, in particular during construction, and will severely impact residents near new developments? Safety and access were criteria considered during the site evaluation process, including by AVDC. Any potential site must meet normal planning requirements for safe access. Sites that do not meet these requirements are unlikely to progress through the NP process. Inconvenience to residents during construction is not something that the NP can impact. During the planning application process, residents should submit concerns in writing to AVDC so they may be taken into consideration during the planning discussion and deliberation. Will the sewage/drainage systems be able to cope with all the new houses? There are ongoing concerns about sewage and drainage in the village. As part of the outline planning approval for Soulbury Road, further detail about the handling of sewage and drainage has been requested from the developers as a condition of the approval. This is a step in the right direction, however it is not a final solution. Stewkley Parish Council would be pleased to hear about issues regarding foul drainage and surface water drainage (with photos if possible) to help us build a picture of the problems that exist in the village and to identify how these could be resolved. I am concerned about the impact on traffic and infrastructure. Will developers contribute towards road infrastructure improvements? Traffic and parking issues in Stewkley are of great concern to the parish and a number of initiatives are being considered by the NP team to reduce the impact of new residential homes and the increase in cars and traffic. These include restricting the number of homes per site, introducing a 20 mph zone in problem areas and extending the AVDC parking standards for new developments so that all car parking requirements can be accommodated off road. Developers will not voluntarily contribute towards improvements for road infrastructure, however they may be required by Bucks CC to make provision for traffic calming, access, pavements, walkways, bridges etc to mitigate the impact of their development. It should be noted that BCC made no such requests for either of the approved planning applications at Soulbury Road and 66 High Street North. A review of speed limits at the boundaries is being undertaken with plans to introduce a 40mph buffer zone to slow vehicles down before they reach the 30 mph speed limit. What is the time scale for Soulbury Road development? Outline planning has been approved by AVDC n February 2017. The time scale is now in the hands of the landowners and developers. Would the school be able to cope with the additional children? Bucks County Council confirmed that they believed there would be sufficient primary school capacity to meet future needs. However, concerns have been expressed by residents about children being transported out to other areas to attend school. Phasing of future developments over the 20 year period of the local plan would help to even out demand for school places, and again demonstrates the importance of a Made Neighbourhood Plan to give the parish some control over its amenities. What evidence is there that one quarter of the new homes built should be adapted for elderly and disabled? There is a clear need for these homes identified in the Village Survey, from which we have concluded that we need some 28 homes suitable for the elderly, many of them to allow for downsizing. That is very close to 25% of the planned new build in Stewkley, which is currently in the order of 120 new homes. From national and Central Bucks data we foresee a need for some 27 houses adapted for wheelchair users. From the village survey returns covering over three quarters of the village, we know of only 8 houses currently adapted. Even allowing for relatively fewer of those disabled responding, this implies a need for some 12 to 15 of new build houses to be adapted for wheelchair users to cope with our aging population. As a percentage, that is about half of the homes needed for the elderly. Will every site be required to provide a housing mix that includes 25% housing for the elderly and disabled? In principle for development sites of 4 homes or more, Yes. Clearly, on a site of 2 houses one cannot build half a home for the elderly. The parish council or other local planners will exempt certain sites because of accessibility problems, slope, need for transport to village facilities etc. However, each exempted site adds to demand for specialist housing on remaining sites. Moreover, there are distinct benefits in integrating the elderly and disabled both geographically and socially across the village. Is Site 15 (Soulbury Road Development) going to be included in the Neighbourhood Plan? Site 15 will be included in the Neighbourhood Plan. Stewkley Parish Council (SPC) stands by its position that large development sites will have a detrimental impact on the local character and infrastructure, will change the village dynamics, and that smaller developments spread throughout the village would create a sustainable approach rather than landowners and developers reaping rich rewards moving from village to village. However, SPC recognises that AVDC has resolved to give permission for the development, subject to a reconciliation between the developers and SPC on housing mix. AVDC and our District Councillor have given us assurance that the developer is to work with the SPC to ensure the housing mix on this site meets the needs of the villagers, and is not solely based on developers’ and landowners’ profits, and to report back to them if this is not to the SPC satisfaction. Is Site 17 (Field behind Methodist Church) included in the Neighbourhood Plan? No. Site 17 has been rejected following consultation with the parish. Sixty-nine percent (69%) of the votes cast for this site were against development. Comments from the AVDC Neighbourhood Planning Team, published with details of this site during the public consultation, confirm the site is identified in the HELAA as unsuitable, citing access and impact on the Conservation Area. Will each site in the NP have to provide a percentage of affordable homes and adapted homes? No. AVDC have their threshold for including affordable homes in relation to the number of homes proposed on a site. AVDC, in their Local Plan, also have a policy that all new homes should be capable of adaption for disability, and that 15% of these must be fitted out from the start. The aim of the NP for delivering affordable homes and homes for elderly and disabled will be achieved across all the sites included in the Neighbourhood Plan, and not site by site. Within the Neighbourhood Plan, each site will have its own development policy that has been agreed with the landowners, and will stipulate the housing mix and percentage of affordable homes, if appropriate, that will be delivered. Why is the Neighbourhood Plan restricting the numbers on each development site to 10 or fewer new homes, a 2014 Ministerial statement has said that developments of 10 or less do not need to provide affordable housing? During a public consultation, Stewkley parishioners voted overwhelmingly for small developments when given the choice between a few large developments and more numerous small developments to meet local housing needs. Recent developments range generally between 8 and 14. Griffin Field has 19 houses and this is an exception. Organic smaller developments spread throughout the village create a sustainable approach to village growth. The justification for the limit on the number of houses per site is linked to precedent and the preservation of the character and feel of our village. Within the Neighbourhood Plan, each site will have its own development policy that has been agreed with the landowners, and will stipulate the housing mix and percentage of affordable homes, if appropriate, that will be delivered. If we try to protect our linear village, we could overcrowd the centre. Isn’t it the case that smaller developments could have a greater negative impact than larger developments outside the boundary, as more views could be affected? The linear nature of the village is a well-established Stewkley feature, supported and protected by the Local Planning Authority. The NP team are aware of the danger of overcrowding and protection of views. The assessment of potential sites takes into consideration aspects such as sloping ground and low rise development to help preserve views into the countryside for existing homes. Why would we support ribbon development beyond the 30 mph signs? Responses from the village questionnaire did not overwhelmingly support extending the current building line. Infill has its problems (see FAQ above) so an option is to modestly extend up to and beyond the current 30 mph signs and create village gateways. Until the final site selections are made, all these remain options which may, or may not, be supported by the residents of Stewkley. Why has a ‘secondary boundary’ been suggested? The current building line for Stewkley has developed over the decades as an uneven, fairly ragged boundary. An option for the village is to create a secondary boundary by smoothing out the existing one up in areas where the extension into countryside would not be intrusive. The Call for Sites brought forward landowners and their sites from all areas of the village. A drafted secondary boundary has been proposed by the NP team and is available for review on the Stewkley Parish Council website. This is an attempt to create a succinct Plan in response to the ‘need’ and comments from the Community, stakeholders, etc. It is for comment at this stage and will be developed to form part of the draft Plan once a conclusion has been made. How can we propose substantial building in the conservation area? Stewkley Conservation area will remain a restraint on any new build, whether within or outside of the Neighbourhood Plan. A Neighbourhood Plan must comply with local and national planning guidelines. Policies for the protection of conservation areas, as in the past, will continue in the future. These policies however do not mean no development but that development might be considered if all the policies in the Local Plan are met. How can we protect the rural nature of the area and farm land, minimise environmental impact, protect our green spaces, and maintain the character of the village. These themes featured very strongly in the village questionnaire when residents told us just how important the countryside and environment is to them. The policies being drafted for the NP are designed to protect these important factors. The villagers will decide if these important elements have been considered when the vote is taken on the Plan at referendum. Won’t new houses increase potential for crime? Respondents to the village questionnaire told us that the felt save living in Stewkley. There are no indications that an increase in the number of homes would result in additional crime. Will we lose our employment area? Any future development of the business park is unlikely to be scheduled for 15 years. Within this timeframe, alternative locations may become available to relocate businesses within the Parish. Will the requirement to comply with the village design guide increase building costs? Why is the Plan stipulating the type of building materials that must be used, and what happens if they are not available? The building materials stipulated in the design guide should not be difficult to source, and should not impact building cost. There is flexibility written into the design guide. Any new development that lies within or is adjacent to the conservation area, is visible from the streets that define the linear village (High Street North and South) or form the entry gateways into the village has a similar look and feel to existing housing stock within Stewkley and is not built to completely different styles and standards than its closest neighbours. A Neighbourhood Plan gives Stewkley the ability to define the look of its village for years to come. How are we supposed to interpret the secondary boundary that is published on the website. It has neither key nor explanation? The hand-drawn drafted secondary boundary was made available for visitors to the March 11 exhibition to consider and comment on this proposal to create a secondary boundary (building line) to the village. In common with many parts of the NP, this remains work in progress and a final draft (with a key and explanation) will be available for comment in July. The initial intention of the diagram was to pictorially show what can be achieved by smoothing the current ragged edges of the existing building line, opening up potential development sites without protruding into open countryside. What is the time frame for development – everything in the 2016 flier seems to be within the first 5 years? The table in the flier identified the timeframe put forward at this stage by the landowner. The actual timing of any development is likely to be very different, and to an extent may be controlled by the NP to be phased over the next 20 years. Can we appeal against the target of 123 new homes imposed by AVDC? The target was questioned by Stewkley Parish Council as it was derived by a formula applied to all villages deemed to be on ‘medium’ size, regardless of the location, amenities and infrastructure. That target is now out of date. 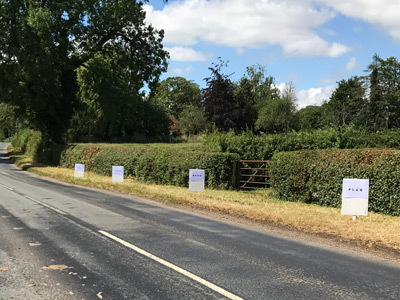 AVDC themselves were criticised for using this arbitrary approach to decide how many homes each village and town should deliver to enable AVDC meet its target, and have adopted an evidence-based approach instead. The actual target number for Stewkley has not yet been revealed (as of May 2017), however the housing land assessment suggests a target closer to 100 might be expected. Why are sites rejected by AVDC in the HELAA being submitted? At this stage all sites put forward by Stewkley landowners remain open for comment and consideration by the parish. Sites may have been rejected by AVDC for reasons that would not stop development. For example, AVDC HELAA rejected sites for development of less than 5 houses. Several Stewkley sites would potentially have 2 or 3 houses only. Would the village miss out on S106 development money if we just had small developments on small sites? Aylesbury Vale District Council decide where S106 monies are spent. It does not always follow the development. We could get S106 money that has been accrued by AVDC from a development in a neighbouring village. Stewkley Parish Council has supplied AVDC with its list of funding requirements. What is the HELAA and where can I find it? HELAA is the Housing and Economic Land Area Assessment document issued by AVDC and is a strategic picture of the availability and suitability of land for development. It is a key component of the evidence base to inform the preparation of the Vale of Aylesbury Local Plan (VALP). Further, it attempts to establish realistic assumptions about the number of homes and amount of economic development that this land could yield and the timeframe within which this might come forward. It may be found here (Stewkley sites are discussed in Part 5). Why do the proposed numbers in the Neighbourhood Plan (NP) for adapted housing differ from those published by AVDC in their consultation document (10% of market homes and 15% of affordable homes)? The recommendation in the NP is that 50% of the new build for elderly and disabled should be built to Category 3 for wheelchair access. Fifty percent (50%) of 25% is 12.5%, which is similar to the AVDC requirement stated in the question. A Neighbourhood Plan is developed by a settlement, like the parish of Stewkley, to deliver what is required for its parishioners and residents, which may vary slightly from the generic requirements for the Vale of Aylesbury. Neighbourhood Planning allows for this variability as long as the parish can justify its requirements and conforms to all national and local planning law. Why does the Neighbourhood Plan stipulate parking requirements that are in excess of those required by Bucks County Council and AVDC? Local demand for better parking provision and fewer cars parked on the roadside has been well documented over the years in Stewkley, including the 2010 Parish Plan (page 11). The requirement that any new development incorporates adequate provision for parking that meets a local need, and not the minimum requirement of BCC or AVDC is not an unreasonable policy. 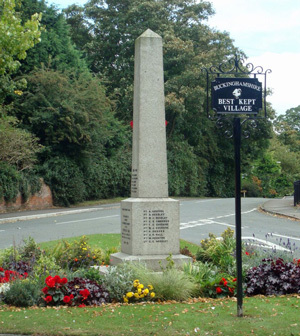 A Neighbourhood Plan gives small rural villages the right to establish its own specific localised policies.